PARADE WILL FORM FOR THE MARCH PAST – PARADE RIGHT TURN! THE HONOUR GUARD WILL LEAD FOLLOWED BY THE BAND AND REGIMENTS – BY THE LEFT QUICK MARCH! Thanks for your support and leadership. sir! Al, we have known each other a long time and I would like to express my appreciation for your devotion to duty throughout your long CSA career! Let us continue to enjoy the gaming that we love so much and the camaraderie that makes this such a special place to be a member of! "Men of Arkansas" by Don Troiani. 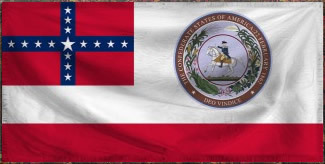 I am immensely pleased to gather everyone here today to celebrate an officer of the Confederate States of America (CSA) Armies who has served the CSA for almost all of the years he has been a member. 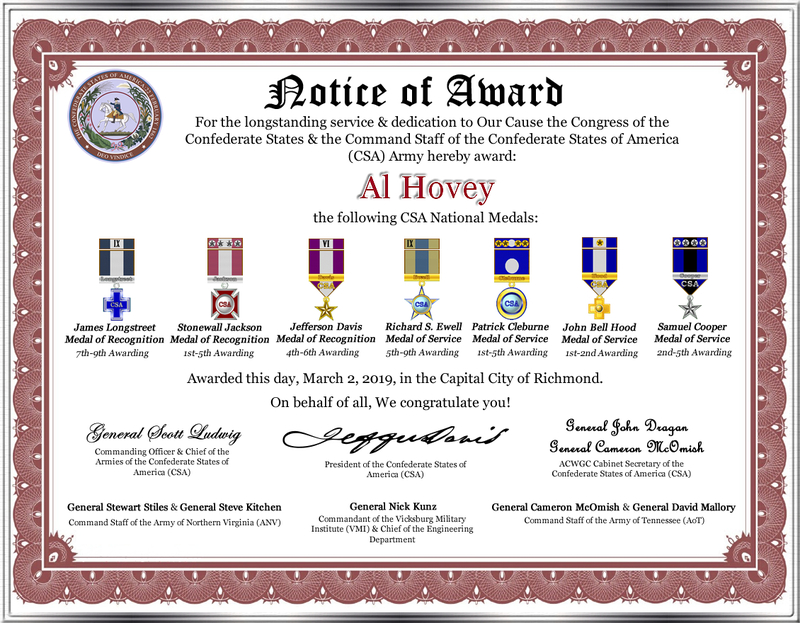 General Al Hovey has quietly served the CSA & in particular the Western Theater of the Confederate States of America (CSA) for nine years having recently retired as the Commander of the Army of Tennessee (AoT) back to brigade command. Al has been in the Club since 2008. He started serving the Western Theater Headquarters in January of 2010 and started serving as the Army of Alabama (AoA) Chief of Staff about the same time. Al became the Western Theater Adjutant General for most of 2013 and stayed as the AoA Chief of Staff until December 2013 when he took over as the Army Commander. 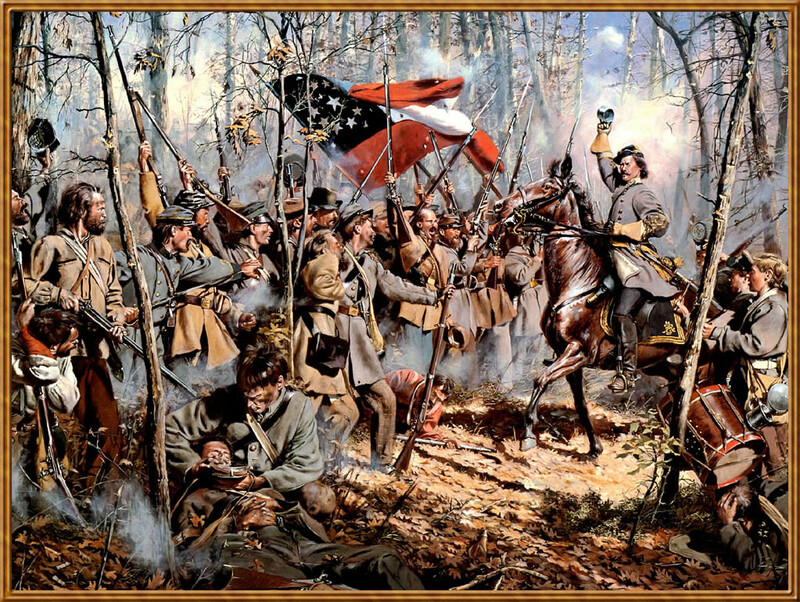 He served in such capacity until through the CSA Realignment, then continued to serve as the Commander of the Army of the West (AotW) and recently served as the Commander of the Army of Tennessee (AoT). Al's service has been 100% dedicated to the Western Theater in one form or another. He has been a long serving, stable hand at the helm of any force he led out there. He served with me personally for quite a number of years in several command setups and has been one of my right hand men. He was one of the best Chief's of Staff I had at the Western Theater Headquarters & I know he was indispensable to General Vern Pinkham when Al served as the AoA CoS. In times of need, Al has always been there to lend a hand, offer an opinion, give suggestions and always willing to do the administrative work needed. He has always been a hands on commander, great with communications and worked with me to hold the final vote on the name of the CSA's western army, as well as sort out the new awards for the AoT. Al has more than earned light duty! In real life Al is a retired teacher having worked in several levels of education and it shows in the way he managed his many commands over the years! I personally am thankful for what Al has done, consider it a privilege to have served alongside him & glad to have him as a friend! I gives me true pride, to award Al the following for his longstanding service. This announcement has been a longtime in the making, I meant to post something similar some years back, so Al deserves each & every medal given him today and then some! Thank you Al from ALL of us! Three Cheers for General Hovey!